A child watched a partial solar eclipse from Virginia in 2014. On Aug. 21, 2017, 154 million Americans walked outside to watch the moon slide in front of the sun — and NASA hopes all those people and more will mark their calendars for April 8, 2024, when another total solar eclipse will cross from Mexico to Maine. NASA celebrated the anniversary of the Great American Solar Eclipse of 2017 with a livestreamed science chat that highlighted the successes of last year's science and outreach programs and reminded eager eclipse chasers of what the sky promises for the next decade. And although Green and his fellow NASA staffers didn't make any promises for 2024, it's clear the agency means to build on its success with the 2017 eclipse. The celestial geometry will also be cooperating by the time 2024 rolls around. That means that during the 2024 eclipse, totality will last longer, about 3.5 to 4 minutes total, and the totality band will be wider than it was in 2017, according to NASA solar scientist Alex Young. "This is going to be a spectacular year," he said. To stay in North America, mark your calendar for Oct. 14, 2023, when an annular eclipse will cross from Oregon to Texas before continuing into Central and South America. An annular eclipse doesn't include totality and the corona never becomes visible because the moon is too far away to completely blot out the sun. Instead, it leaves a "ring of fire" — so be sure to wear protective eyeglasses the entire time. And if you still have those eclipse glasses you found for last year's extravaganza in perfect condition, you can turn any day into a trip down memory lane by taking a glance at what our sun is up to. 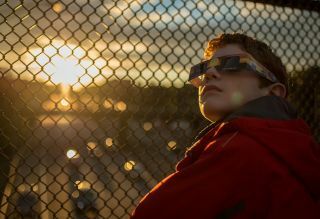 "These are not just eclipse glasses, these are solar-viewing glasses," Young said. "You don't need an eclipse, all you need is the sun, and it's out there every day."